Heidi Lange is a renowned artist, and experienced professional guide, and avid traveller and a successful business woman and still finds time to ski through the Northern Swedish Laplands. Her international background is as diverse as the spectrum of her artwork, being of German origins with a Swedish heritage, she grew up in Solna on the periphery of Stockholm. After her university degree in linguistics and art history, she attended Bergh's Reklamskola for two years and graduated in publishing art design. Her first travels took her to France and after one year of freelancing in Paris, she became aquainted with Theo Kerg's famous artistic relief technique and was offered a scholarship to study in the well known Art Academy in Rome. She accepted the offer and studied for four years with Professor Mafai and Avenali. This period was very important in the evolution of Heidi's artwork. The surrounding influence of anciend Roman culture and the multi-cultural social environment of the art academy gave Heidi new energy and inspiration. Her artwork evolved into bysantine collages of paintings, she experimented with her first lightly fire torched paintings, marking the beginning of being distinguished as "the artist with a brush and a blow-torch". an engineer working int he United Artist film industry. With him, she travelled to Colombia and was enrolled in the film Quemada with Marlon Brando for one year. In 1970, they discovered East Africa, and decided to stay in Kenya's beautiful Rift Valley where to date they still live for most of the year. Heidi was fascinated by the African tribes and their cultural traditions. Especially the Masai, the bravest of the warriors and famous nomads of the Serengeti and teh Mara savannah plains, have featured in hundreds of her silk screened prints. These silk screen, tie dye prints, have become quite distinctly famous, finding themselves in many of the art galleries and museums all over the world. The Masai's cultural tradition as nomadic pastoralists soon became the link to the nomadic lap tribes in Heidi's homeland - the North of Sweden. Many similarities in their ways of life and traditions can be seen from her ethnic designs of Lapland. 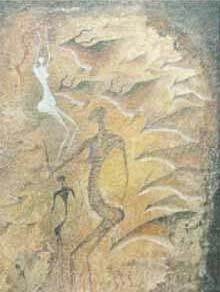 Even her African rock paintings brought her back to Sweden to the characteristic rock-paintings of Bohuslan. Over these last years, Heidi has focused and studied the Viking designs; in particular the picture stones from Gotland. Currently, Heidi's life has been divided between Sweden, Rome and Kenya. The annual cross country skiing in Lapland is a tradition she has liked to participate in for many years, as is spending the summers at her holiday retreat in Sweden's beautiful archipelago, canoeing between the neighboring islands. She alternates this with her authorized guiding profession in Stockholm. Since her early university days, she has found Stockhold to be the most beautiful city in the world, and has since then achieved the title of professional guide in an array of different languages. The passion for Stockholm's historical significance provided inspiration for reviving her artwork in the souvenir business where she aims to show that well designed souvenirs do not necessarily become expensive. As a result, there are now hundreds of souvenirs with Heidi Lange's design and traditional artwork available.